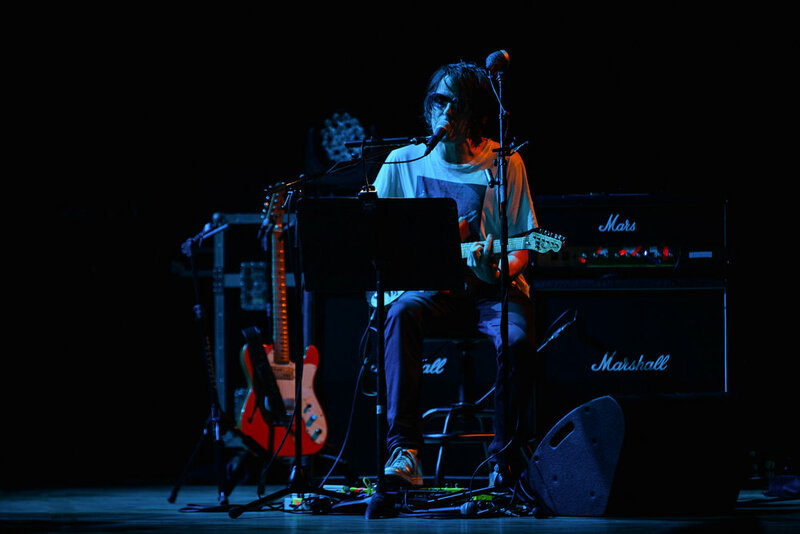 Touring their latest release in six years, And Nothing Hurt, Spiritualized brought grandiose space rock to the Orpheum Theatre in Los Angeles Wednesday night. The sold out show set to begin at 8 was pushed to 8:30 due to the immense volume of empty seats. As more people arrived, the civility of the patrons was almost overwhelming. The lobby was quiet enough to hold conversation, the lines at the bar tame. With the median age of the crowd easily pushing 35, a percussion section including timpani waiting on stage, and the beauty The Orpheum lends, it wasn’t hard to imagine we were waiting to see the LA Phil. That placid vibe did not last. Opening with the crashing “Come Together”, people were out of their seats despite signs that advised otherwise. After playing a myriad of other tracks off both Ladies and Gentlemen We Are Floating in Space and Laser Guided Melodies, the signature morse code of And Nothing Hurt appeared and “Perfect Miracle” began the dive into songs off the newest album. And Nothing Hurt has been applauded by critics for its ability to connect listeners to the more mundane and pedestrian side of Spiritualized's mastermind Jason Pierce without losing the complex sonic landscape he’s known for. This feat, the ability to make a topic as mundane as lying about a broken cell phone to excuse ghosting someone lush and cinematic, becomes even more staggering upon the realization that (for the first time in his career that spans over 30 years) Pierce conceived and recorded the majority of the album on a laptop in his east London home. Wednesday’s performance hardly resembled a bedroom composition. Spiritualized was joined by Wordless Music Orchestra (known for live scoring screenings of new and classic films as well as performing with acts such as Neutral Milk Hotel, Flying Lotus, and Oneohtrix Point Never) and the LA-based DC6 Singers to generate that full-bodied, monumental sound they’re known for. This was demonstrated in the expertly cacophonous “On The Sunshine” and the final song of the evening, “Oh Happy Day”. When you go to as many shows as I do, you have to be pretty religious when it comes to protecting your ears. But there are some shows worth the hearing loss. Some shows are just meant to be felt. This was one of those shows. Sorry, mom. Click the photos to scroll through them big. Shot for Grimy Goods.